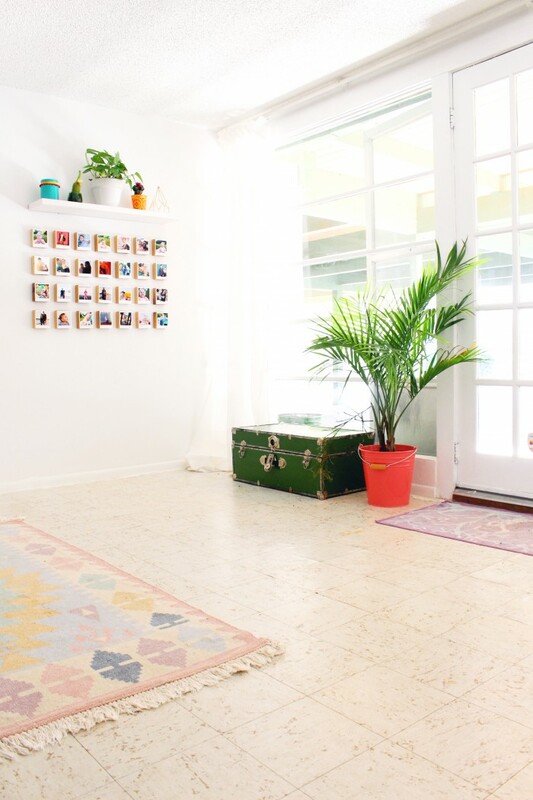 Colorful Boho Entryway & The Easiest Tip to Make Your Rugs Look Better! 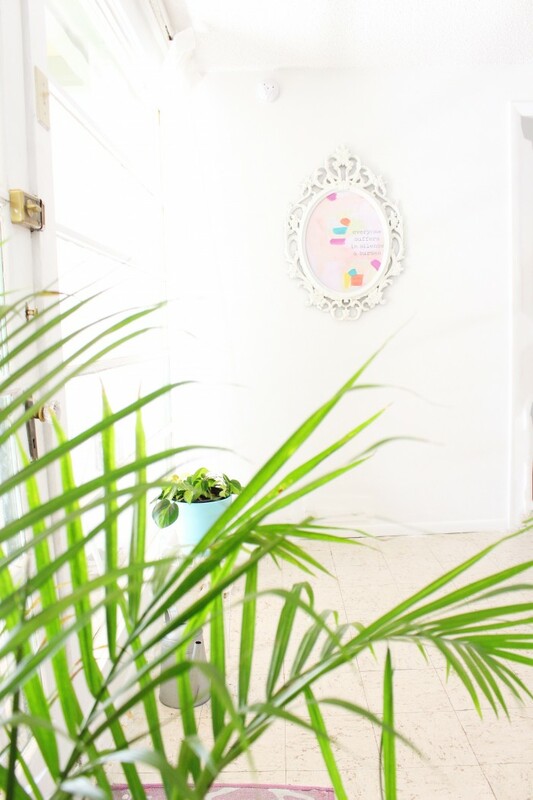 I’m excited to introduce you to a new room in my home-my colorful boho entryway! Do you wanna know a secret? I cut corners. A lot. I like to get things done and I will look for every way possible to do that quickly and efficiently and, usually, cheaply. 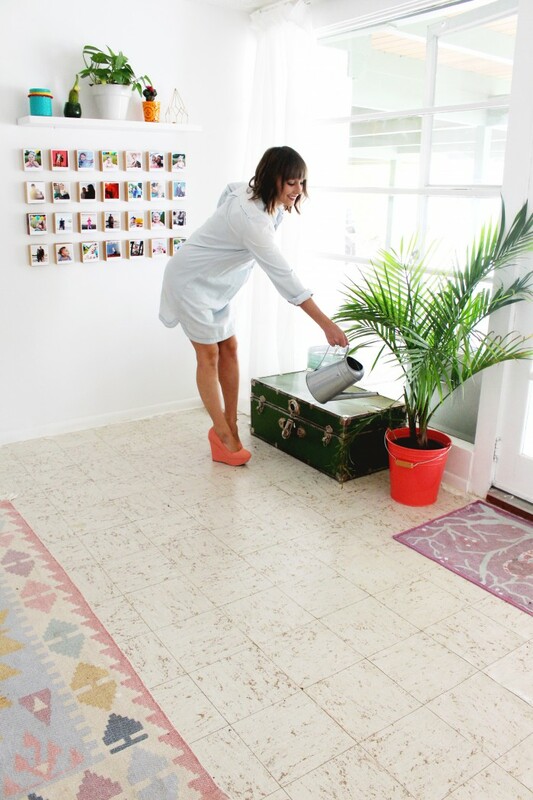 And one way that I’ve done this in my current house, is to forego rug pads. 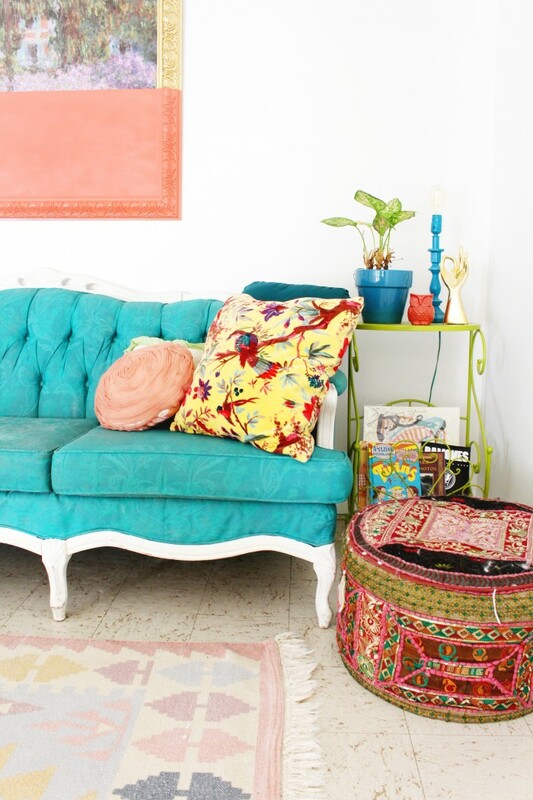 Seriously, We’ve gotten up to 20 rugs in this house (umm…obsessed much with rugs??!) and not one of them had a pad. Only like 6 of those needed one, but I didn’t think any did! I honestly thought pads were just for rugs that slip around or easily wrinkle up and so none of my large area rugs had a pad. I just threw down the rug and called it a day! But guess what I learned? 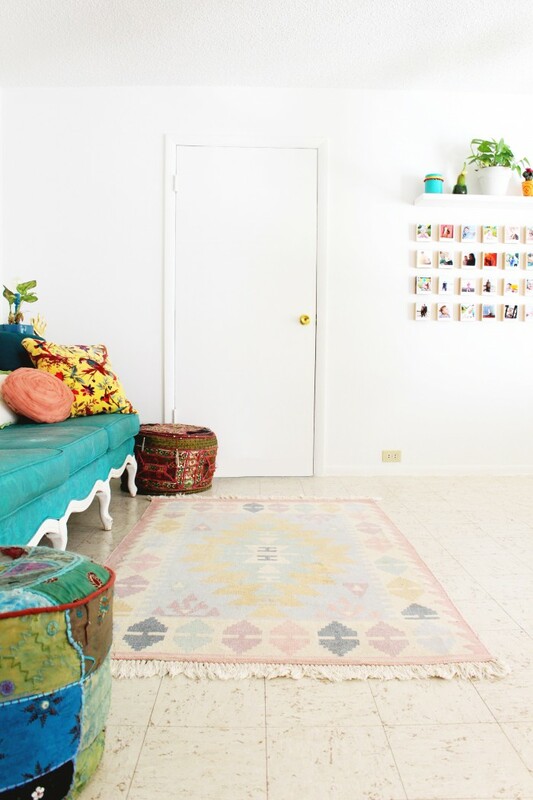 Not only are rug pads helpful for the above mentioned annoyances, but they also help in other ways AND, this one surprised me but, they can actually make the rug (and by extension-the room) look better! Among the things that rug pads obviously do (protect your floor from wear, dirt, getting dyed by the rug, etc) I also couldn’t believe how different my rug looked to me after it had the soft pad underneath! 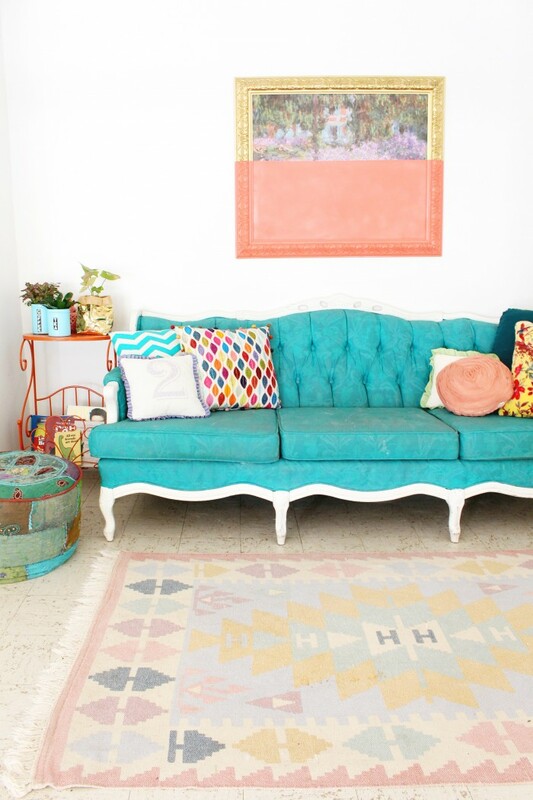 I went with the RugPro so it adds a little bit of cushion which I feel really gave my rug some life! It’s just slightly plumped up now, and softer. And, actually having a softer rug is pretty important to me! I hate to set my baby down on a concrete or hardwood floor with nothing but a thin rug to support him. Now, with a rug pad, I know his head is padded. This room is the entryway of my house, where the front door comes through and my mother-in-law, who grew up in this house, calls it the breezeway. I believe it was formerly the front porch before they closed it in with windows and added it onto the house, extending a new, smaller porch out front. Because of this the floor is concrete underneath. The concrete is underneath these laminate tiles which I actually don’t hate. In the other rooms where this really long, awful, OLD, yellow shag carpet was, it was hardwood floor (you can see in this post) or concrete, which we either painted or acid stained, underneath. But in the rest of the house its plywood and all of it needs help. While this tile is nothing like anything I would choose, it works I think. Its light and basically just not very noticeable. 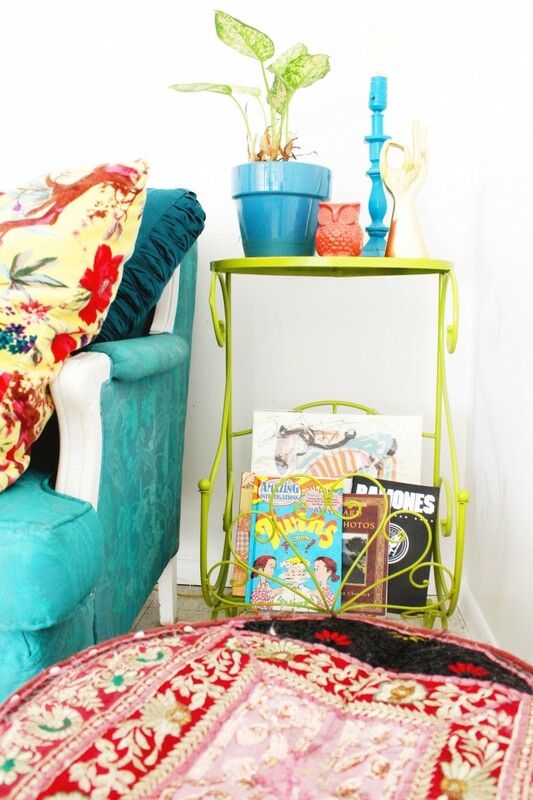 And this rug–the moment I saw it on Urban Outfitters, I just had to have it! I was so excited it fit in with my colorful entryway! BTW, for anyone who wants to know what the secret is to keeping house plants alive, I believe it is to water consistently! That means, once a week, the same day every week (or close! ), and the same amount of water each time. If you forget to water them one week, don’t give them more water to make up for it, actually give them slightly less so they don’t drown! Be consistent and give less than you think, that’s my tip! Other details of this room include: my favorite Belle & Sebastian quote, a modern color-blocked thrifted painting (instructions right here! ), light, airy curtains so I don’t block those most-fabulous walls of windows, another smaller owl rug (also from Urban, though years ago. It never worked in any other room before and I was so excited to finally put it out! ), some fun and silly books and records, my hand painted (yes, painted!) 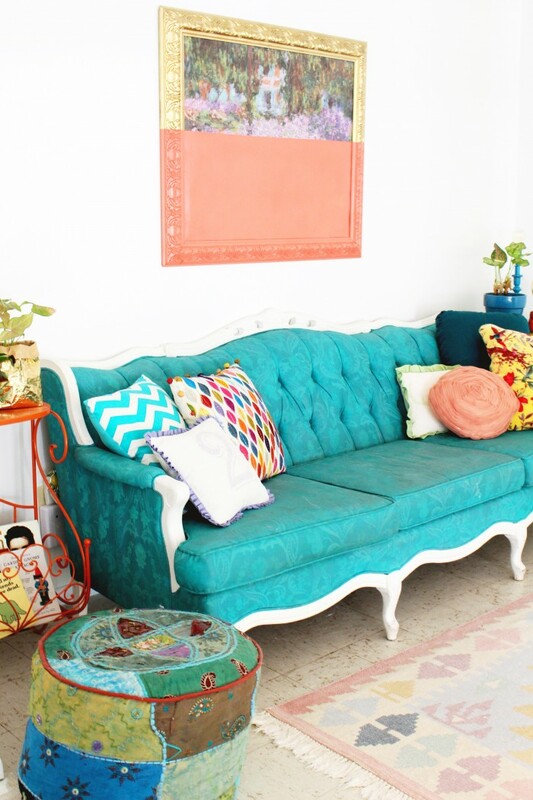 turquoise couch, my DIY polaroid blocks, and a great little array of knick knacks! 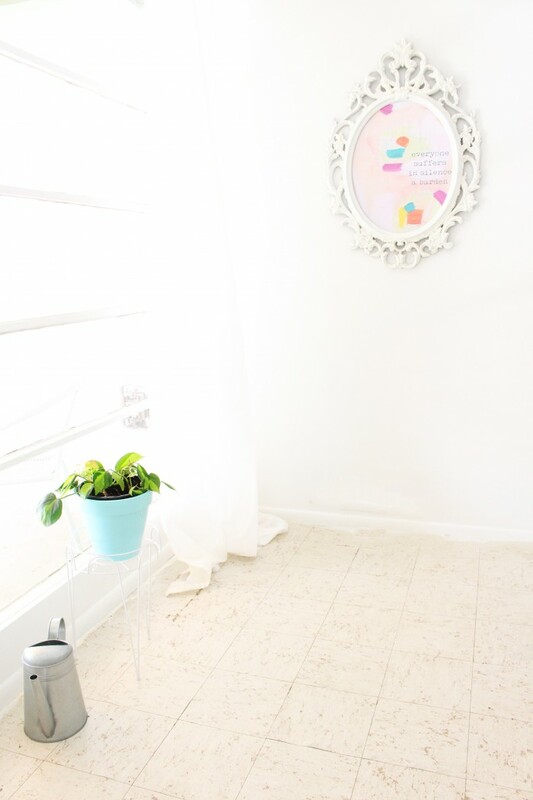 I love learning new tips and tricks to make the rooms in my house look more professional and useable! I really feel like this rug pad gave the rug life and I’d HIGHLY recommend it for any kind of hard flooring! 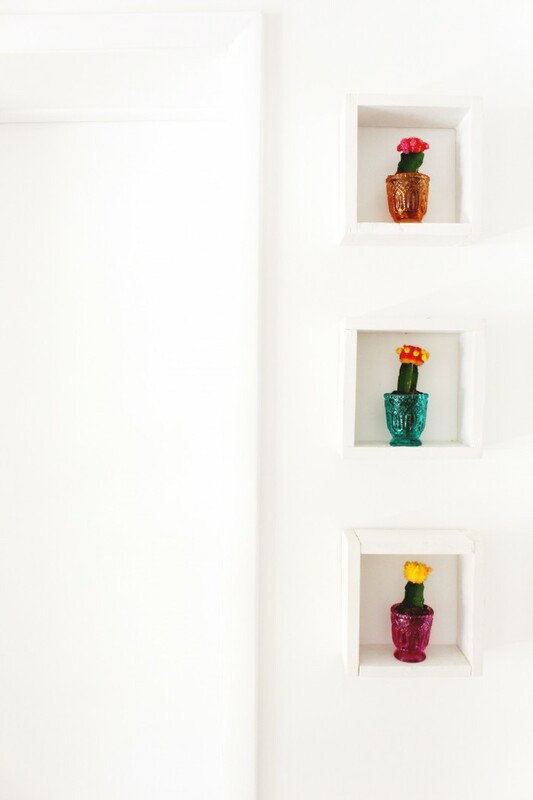 It comes cut to your specifications and you will not be disappointed :) What’s one small and easy tip you’ve learned to help your home decor pop?! I wanna know! Leave your tricks in the comments below! 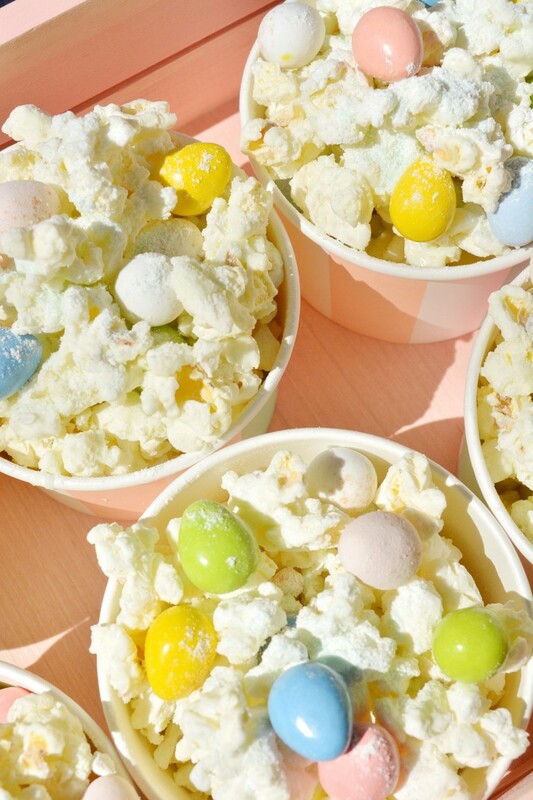 The delicious Easter candy popcorn mix features the delicious taste of pistachio pudding and chocolate Easter eggs! Plus, it’s so easy to make! Perfect for Easter parties. As is the norm with our recipes, this popcorn recipe is super easy and perfect for your next celebration. Which for a lot of us will be Easter but this could just as easily be used for any spring gathering. As I was making it this weekend I was so happy because I finally feel like it is truly spring. I start to get a lot more active at this time of year it’s like my body is waking up from hibernation a bit and I am ready to double down on all of my fitness goals. This also means that I feel less guilty in indulging in all of the incredible Easter candy out there. Now you name me one holiday that has better candy than Easter. Blanking? That is because there is no holiday that beats Easter when it comes to the candy game. None. Cadbury eggs (mini and large), Reese’s eggs, Peeps (where the cuteness makes up for taste), Butterfinger eggs, Oreo eggs (they’re a thing! ), peanut butter eggs, egg M&Ms, etc. It is just the best. Now I am really wishing I had a stash of this candy right now. Well it also turns out, to no surprise, that this candy is the perfect addition to popcorn. And this popcorn is possibly the best popcorn I have ever had. And I buy popcorn every time I am at the store. Machelle had this genius idea to add pudding mix to popcorn and this one uses my favorite flavor of all time – pistachio. As you will see you can also experiment with other flavors – caramel, vanilla, butterscotch, chocolate, and banana cream would all be delicious as well. This recipe could work for any occasion with other candy or no candy at all. But I decided to add my favorite Easter candy given that Easter is only six days away. 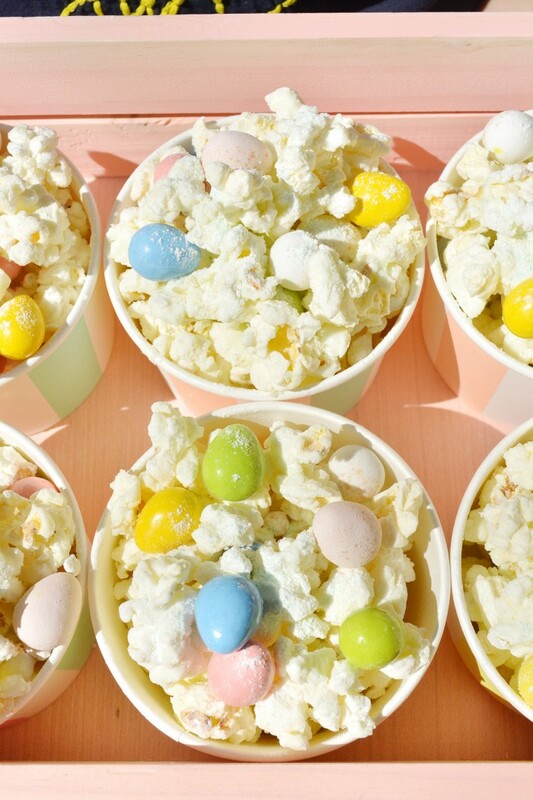 So if you’re heading to a nice family dinner or an egg hunt this upcoming weekend make sure to bring this simple popcorn with you!